The trouble with common knowledge is that it tends to be so common that people forget to write it down, thus, it gets left out of the historical record. Take Gypsies, for example. Supposedly, bands of Gypsies were a regular sight in Little Falls. One wouldn’t know that from reading past issues of the Little Falls Daily Transcript (LFDT), however. In scanning numerous issues of the newspaper between 1899 and the 1930s, I discovered that articles about Gypsies in the city are rare. Of those infrequent articles, a bonanza of two was found in the Transcript on May 27, 1910. One headline read Fortune Tellers Become Too Bold: Fair Members of Swarthy Band Said to Have Relieved Bachelor of His Money, while the other stated, Wanted to Sell Her Little Girl: Gypsies Offer Six-Year-Old Girl for Sale at Buyers’ Own Price. While my search through the newspapers wasn’t exhaustive by any means, I did expect to find more on Gypsies. The fact that I didn’t led to several questions. For what period of time were they known to visit the city? How long did they stay? How often did they visit? Were there any positive stories about Gypsies, or were only negative interactions reported? Who were the Gypsies? It was the distinctive language of the Roma that allowed scholars to trace them back to India. No one is sure what caused the original migration of the Roma out of India, although persecution or political upheaval is suspected. Since that time, the Roma, due to their ethnicity, continued to be persecuted. This was one of the primary factors leading to their nomadic existence. For five hundred years, Roma were enslaved in Romania. They were singled out for their race and interred in concentration camps during the Holocaust, which led to the extermination of an estimated 500,000 to 1.5 million Roma. (2)(3) Discrimination of the Roma is ongoing and persists to this day, especially in Europe. The history of the Roma is complex and, while they definitely had a glancing relationship to Little Falls and Morrison County, the documentation of their time here seems to have been chased out along with them. (1) Gypsy Lore – Rom History, Fortune Telling, Holocaust, http:///www.gypsyadvice.com/gypsy_lore.htm, website accessed December 22, 2006. (2) The Patrin Web Journal – A Brief History of the Roma (Gypsies), http://www.geocities.com/~Patrin/history.htm, website accessed December 22, 2006. (3) Roma people, Wikipedia, the free encyclopedia, http://en.wikipedia.org/wiki/Roma_people, website accessed December 22, 2006. (4) The Patrin Web Journal – Popular Myths, http://www.geocities.com/~Patrin/myths.htm, website accessed December 22, 2006. (5) The Patrin Web Journal – Romani (Gypsy) Beliefs, http://www.geocities.com/Paris/5121/beliefs.htm, website accessed December 22, 2006. (6) The Patrin Web Journal – Traditional Occupations, http://www.geocities.com/~Patrin/occupations.htm, website accessed December 22, 2006. 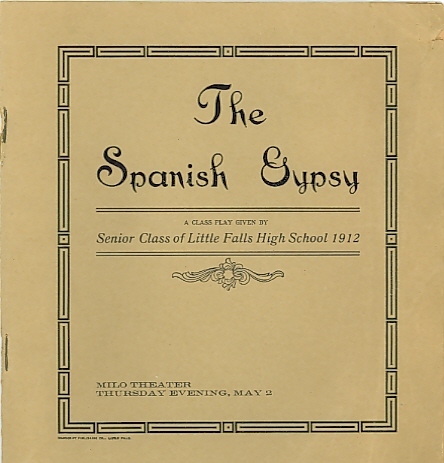 Program cover for "The Spanish Gypsy," a play performed by the Senior Class of Little Falls High School on May 2, 1912, at the Milo Theater in Little Falls, Minnesota. Spaniards, Moors, Gypsies, Soldiers, Etc. The senior class play, “The Spanish Gypsy,” presented at the Milo theater Thursday night was well given and showed the result of much practice. In spite of the threatening weather, the rise of the curtain found the house packed. The play is taken from George Eliot’s book, “The Spanish Gypsy,” and the scene is laid in Spain in the latter part of the fifteenth century during the war between Spain and the Moorish tribes. The costumes were unique and pretty. The play is in five acts and the scene passes from the town of Bedmar in Spain to the encampment of the Gypsy tribe in the mountains and the astrologer Sephardon’s tower. The part of Fedalma, betrothed to Don Silva, was well taken by Miss Rosebud Fortier. She was loved by Don Silva when thought to be a member of the despised tribe and was followed to the stronghold of her tribe by him but it developed that she was the daughter of a Spanish nobleman and had been placed in the hands of the Gypsies by the astrologer Sephardo, who sought to avert the fate of Don Silva as he read it in the stars. The part of Don Silva taken by Ray Matteson and the part of Zarca, chief of the Gypsies, taken by Chester Longley, were well played. Ivan Kay as Father Isador, prior of San Domingo; Frank Hall as Juan, the poet, and Fred M. Richie as Sephardo, the astrologer, are deserving of praise. Rose Bourassa as Pepita made a hit with her singing and the dancing of the Gypsy girls was especially good. Miss Hazel Tourtillotte played some pleasing selections on the piano between acts and also played for the songs and dances. Miss Alice M. Lancaster, who had charge of the play, deserves great praise for its success.